Combine flour, baking soda, baking powder and salt in small bowl. Spoon into 1-quart, wide-mouthed canning jar. Layer remaining ingredients in order given, making sure to firmly pack down each layer. Clean inside of jar with dry paper towel after each layer. Decorate lid by cutting fabric into 7-inch wide square or circle. Secure with rubber band; tie with decorative ribbon and accents. In a large mixing bowl, cream together 1/2 cup softened butter or margarine, 1 egg and 2 tsp. vanilla extract until combined.Slowly add contents of jar and mix well. Roll dough into 1-inch balls and place on greased cookie sheet. Using the back of a spoon, flatten cookies slightly. Bake at 350°F for 12-14 minutes or until lightly browned. 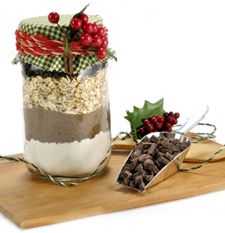 1 gift jar with mix for about 3 dozen cookies.